Silk Scarf Handpainted. Coral, Yellow, Lavender Hand Dyed Silk Wrap. Handmade Silk Shawl CORAL SUNRISE. Large Square 30x30. Wedding Gift. Silk Art. 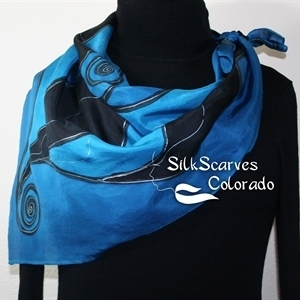 This is a 100% smooth China silk scarf in black, blue and deeper shade of turquoise ; decorated with metallic spirals in black and silver. All outlines are done in black. 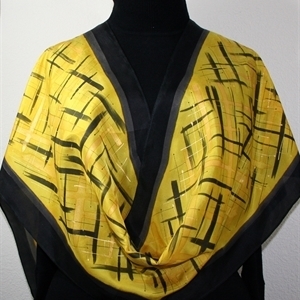 It is a square silk scarf, chic and elegant. SIZE: This is a LARGE Size Square scarf - 30"x30" square (76 cm x 76 cm). This is original size - slight shrinkage occurs due to the steam-setting process. Hand Painted Silk Scarf. Blue, Black Handpainted Square Silk Shawl NIGHT WINDS. 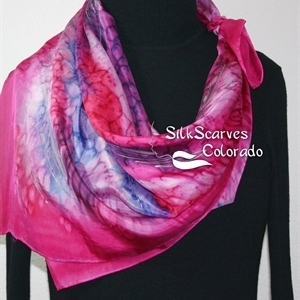 Silk Scarves Colorado. Size Large 30x30 square. Birthday Gift. This is a 100% Habotai silk scarf in shades of pink, lavender, purple, aubergine and periwinkle; decorated with accents in silver. SIZE: This is a LARGE Size Square scarf - 30"x30" square (76 cm x 76 cm). This is original size - slight shrinkage occurs due to the steam-setting process. This is a 100% Chiffon silk scarf, featuring circles and triangles in shades of blue, sky blue, turquoise, denim blue, navy blue - with some periwinkle. Border is in a medium shade of blue. Decorated with thin accents in white. The design is reminiscent of clockwork. 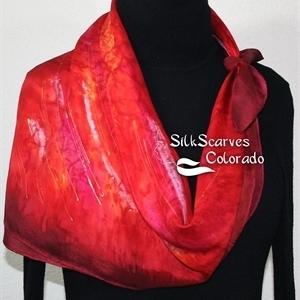 This scarf is chic and feminine, and makes a great accessory to any outfit. SIZE: This is a LARGE Size Square scarf - 30"x30" square (76 cm x 76 cm). Red Silk Scarf. Merlot Red Hand Painted Scarf. Handmade Square Scarf BURNING PASSION. Birthday Gift. Bridesmaid Gift. Gift-Wrapped. Size 30x30 square. This is a 100% smooth China silk scarf in shades of red: scarlet red, crimson, merlot red, bordeaux and darker burgundy, creating a border-like ending of the scarf. Decorated with contrasting accents in white and bronze. It is a square silk scarf, very chic and elegant. Medium Square Size: 30" x 30" square (76 cm x 76 cm).